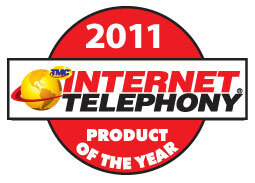 MONTEREY, CA (January 4, 2012) Network Intelligence announced today that TMC, a global, integrated media company, has named SIPConnect as a recipient of the 2011 INTERNET TELEPHONY Product of the Year Award. “I am happy to grant Network Intelligence with a Product of the Year Award. The editors of INTERNET TELEPHONY have verified that SIPConnect displays quality and innovation plus provides real needs in the marketplace,” stated Rich Tehrani, CEO, TMC. “I would like to congratulate the entire team at Network Intelligence for their commitment to advancing IP communication technologies.” 2011 Product of the Year winners are published in the January/February 2012 issue of INTERNET TELEPHONY magazine, (www.itmag.com). INTERNET TELEPHONY has been the authority in IP communication since 1998™. About INTERNET TELEPHONY magazine: INTERNET TELEPHONY has been the IP Communications Authority since 1998™. Beginning with the first issue in February of 1998, INTERNET TELEPHONY magazine has been providing unbiased views of the complicated converged communications space. INTERNET TELEPHONY offers rich content from solutions-focused editorial content to reviews on products and services from TMC Labs. INTERNET TELEPHONY magazine reaches more than 225,000 readers, including pass-along readers. For more information, please visit www.itmag.com. About TMC: TMC is a global, integrated media company that helps clients build communities in print, in person, and online. TMC publishes the Customer Interaction Solutions, INTERNET TELEPHONY, Next Gen Mobility and Cloud Computing (formerly InfoTECH Spotlight) magazines. TMCnet.com, which is read by two million unique visitors each month, is the leading source of news and articles for the communications and technology industries. TMC is the producer of ITEXPO, the world’s leading B2B communications event. In addition, TMC runs multiple industry events: 4G Wireless Evolution; M2M Evolution; Cloud Communications Expo; SIP Tutorial 2.0:Bringing SIP to the Web; Business Video Expo; Regulatory 2.0 Workshop; DevCon5; HTML5 Summit; CVx; AstriCon; StartupCamp; MSPAlliance MSPWorld and more. Visit TMC Events for a complete listing and further information. This entry was posted in Awards, News, Press Releases, Products, Uncategorized and tagged 2011, Award, Internet Telephony, Network Intelligence, Product of the Year by admin. Bookmark the permalink.